Finally a PRICING GUIDE now EXISTS! Love Lettering is celebrating its 5th year in business and we have learned a lot along the way, so much of it was trial and error, and figuring things out along the way. What I always knew that I had was the love and passion of lettering, attention to detail and really good customer service skills as I worked in this industry for 20 years before I started the company. However the struggles that we encountered were always the NOT fun side of the business like creating a website, filing for a business licenses, trademarks, and accounting… who likes accounting? Is it because accounting makes us analyze if we are ACTUALLY a sustainable business? Is it because accounting is going to tell us that we made NO money last year? I think that is one of the reasons businesses are successful and not, you have to KNOW your NUMBERS. And that starts with PRICING. How do you even begin to start charging people? 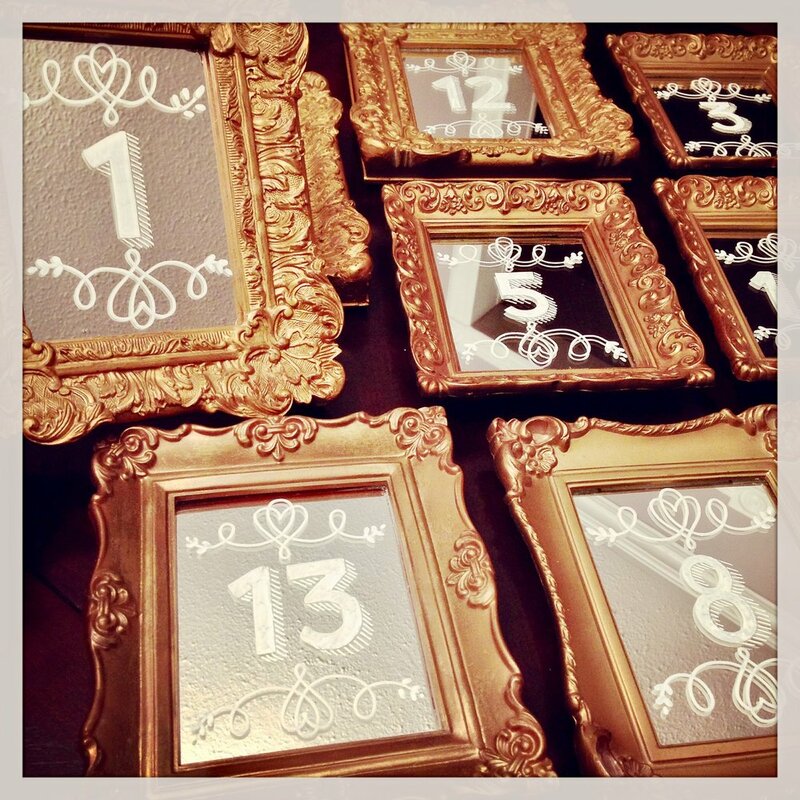 $20…….TWENTY DOLLARS for 13 of these table numbers! Can you BELIEVE it? Look at the details! How long did I spend on these pieces? I could not tell you but lets do some math here…. 20/13 is $1.54, and each one had to have taken me at least 15 minutes to create, so yes, I am pretty sure I did these for under $7/hour. Now I know I mentioned that I knew that my hourly rate should be more than minimum, but these 13 pieces were included in a WHOLE set of 10+ pieces, so the entire job itself was probably in the $700 range for these and many other pieces, so I figured HEY, I am making more on the other items and $700 for a job is so great doing what I LOVE but the business minded me today would not take anything less than $10/number for something as intricate as these. Sizes of these Welcome Signs come in all different shapes and sizes! Obviously a bigger sign is going to require more time to complete. Wording, the amount of words ON each piece will also dictate HOW long the sign will take to complete as well. Illustrations, Monograms, Decorative Fonts these take much longer to draw/letter than your run of the mill freehand modern cursive, so of course these would need a surcharge for execution. Surface Different surfaces have a different approach to how they are lettered, some are easier to clean and correct errors, some need more prep time before lettering. For example, chalkboard requires more time as there is time spent on sharpening chalk, or pencils while lettering, if I was lettering a 250 person seating chart this would take me much longer than a mirror that uses a paint marker with a continuous flow of ink. So How Is The Guide Going to Help? The above examples are only a FEW of the oopsies that happened throughout the beginning of our company and now there is a FANTASTIC pricing guide out now called the PANIC FREE PRICING guide created by Becca of the @happyevercrafter and Joanne of @indetailcreative that actually talks about SO many of the topics and situations that arise when you are just starting out your lettering business. The 98 page guide along with the video tutorials are so crystal clear about how to value your time and what the market price is for creative lettering in the industry as a beginner. I not only found it to be insightful to beginners, but to me! A gal that has been IN the industry for 5 years, wrote a book, and hosted workshops! As I always say there is SO much more to learn but we all start somewhere. With experience you will know when to increase your prices however this guide is perfect for the creative letterer that wants to start a side hustle, OR take their side hustle to a full time career. What I found especially helpful was not only letting you know about how to price, but also what opportunities lettering can lead you as well! They talk about the wedding industry, commercial work, murals, hosting workshops, making gifts, and SO much more. Topics such as community over competition are brought up as well to show you how undercutting is like peeing in the pool, they may think its okay but they are also swimming in the same pool and making it dirty really isn’t good for anyone. Keep the prices standard, let the work/artist speak for themselves. I believe if you actually go through this guide/course you will feel confident in pricing and providing quotes for your clients, the only thing left to do is DO GOOD WORK! If you do great work, and you are priced fair its a winning combination and your business will thrive. The Panic Free Pricing Guide is money well spent as it may pay for itself after one use if a commission comes up and you know how to quote properly. I just know that this will save a lot of people a LOT of time and I felt like it was my duty as an artist and hand letterer to let people know what a great tool this guide is. How much would you pay for confidence when quoting? How much would you pay for peace of mind, knowing how much your skill is worth? I hope you find it helpful, I wish it existed when I started and I wish you all the best in your journey ahead!